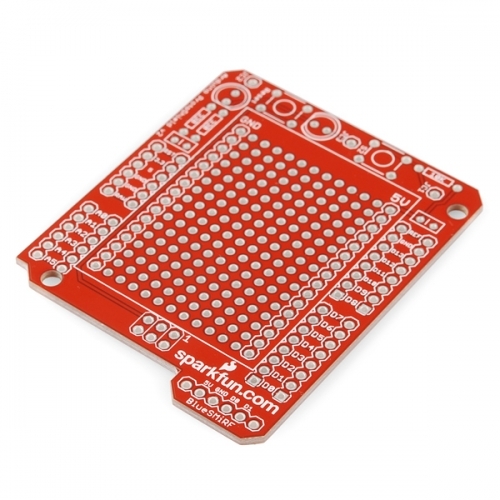 Description: By popular request, we’re selling the always-handy ProtoShield PCB on its own! Originally spawned with collaboration between the folks at ITP @ NYU, the ProtoShield mates with an Arduino development board and gives the user a small soldering area, two general LED footprints, access to a BlueSMiRF socket, a general pushbutton switch footprint, and most important of all - the Arduino reset switch is brought to the top level. Now you don’t need to buy the whole ProtoShield kit if you just need a piece of prototyping board that will fit on top of your Arduino. You might want to grab a stackable header kit, though, which you can find in the related items below.